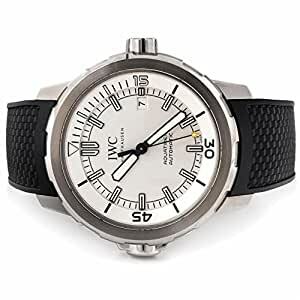 Pre-OwnedÂ IWC Aquatimer 2014 (IW329003) self-winding automatic watch, features a 42mm stainless steel case surrounding a silver dial on a black rubber strap with a stainless steel tang buckle. Functions include hours, minutes, seconds, and date.Â This watch has minor wear on bezel and comes complete with box and papers. Majority of time remaining on the factory warranty!